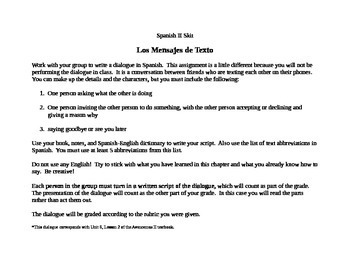 For this assignment students work in groups to write a skit in Spanish about some friends texting one another. They must incorporate some Spanish texting abbreviations in their conversation (similar to LOL, TTYL, etc. in English). 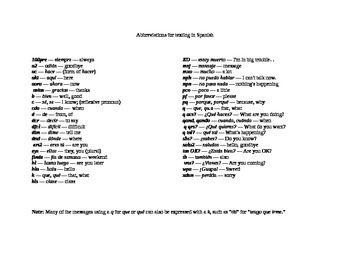 A list of texting abbreviations is included. 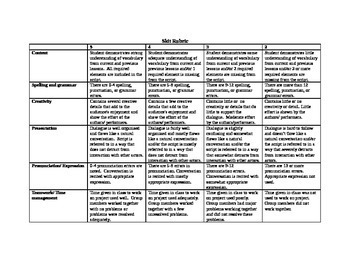 The assignment details requirements for the skit and includes a grading rubric. This assignment corresponds with Unit 6, Lesson 2 of the Avancemos II textbook, but could easily be used with other curriculums as well. I assign one skit per unit, so visit my store to find other skit assignments as well. You may also purchase all of my Spanish II skit assignments as a bundle at a reduced price.